Marvel's The Punisher Full Trailer | Nerd Much? Frank manages to make a few friends that he isn’t trying to kill. 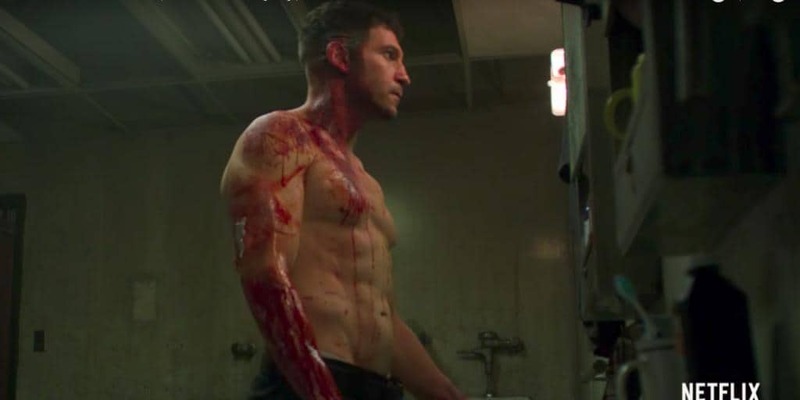 Netflix has finally released the full trailer for Marvel’s The Punisher. We finally see a little more of the main character and the supporting cast. Most fans already know the plot too well, Frank Castle, as played by Jon Bernthal, is a military man just come home from a long mission out. After relishing in the joy of being with his family again and looking forward to a long and uninterrupted future – a group of men come in a brutally kill the entire family except Frank. The rest is history, where Frank exacts his revenge while quite a few organizations are hunting him down. Probably because he’s dangerous to a certain group of people, but that’s just a guess. On the way, Frank manages to make a few friends that he isn’t trying to kill, Karen Page as played by Deborah Ann Woll, Micro (Ebon Moss-Bachrach), Dinah Madani (Amber Rose Revah), and Rawlins (Paul Schulze). A few of which actually appear in the trailer. Eventually, of course, revenge is exacted for Frank, and we’ll soon see him fighting crime in general. I’m sure he’ll become even more badass as the series progresses. There’s more to it than that, of course, as it is Frank who discovers a conspiracy in New York that affects more than just the famous city. That said, there is no official release date beyond fall 2017. Netflix teased it again at the end of the trailer, cutting the date off before it appears properly. There is a rumored date for sometime in October, but I would wait until there’s at least one more trailer to show for it. Even then, finished production might still be a few months away. Thus far, The Punisher certainly looks like a well put together series, but it is easy to make this story sound cliche and not a little boring. Hopefully the producers will not fall into that pit of overacted and badly choreographed fighting scenes. Never mind that it comes at the price of the plot. But we shall see soon enough.